Enjoy a comfortable and ergonomic typing experience for the ages. When your workday requires the use of a computer for multiple hours a day, give yourself tools that help you keep your arms, shoulders, and body in alignment for safer typing throughout the day. This quiet keyboard is great for open work environments where background noise is a reality, it's a great solution to help keep ambient noise levels down and help your employees maintain better focus. The keyboard features a consistent force throughout the full stroke of the key, so there's no tactile feedback unless the switch bottoms out. And thanks to having no “peak” or tactile force, the total effort required to reach the activation force of 45 gm is slightly less than Kinesis keyboards with the tactile (brown stem) switch. The Advantage2 LF Keyboard includes 2 MB of onboard memory, offering the space for more than one hundred macros. Create your own macros to replace repetitive key strokes and then share them with friends as a text file. Advantage2 uses generic HID (human interface device) drivers provided by the operating system. It can be operated and programmed without any special drivers in most environments supporting USB devices, including the following operating systems with an available USB port. This simple, textured foot pedal can be programmed to provide quick and easy access to common keyboard functions. Compatible with all Kinesis Advantage2 keyboards, this foot pedal can be anchored to the floor with the included self-adhesive hook and loop tab. The triple action pedal provides even more functionality for your Kinesis Advantage2 keyboard. This pedal can be configured to activate any user-defined macro or keystroke. This is a very well designed keyboard. 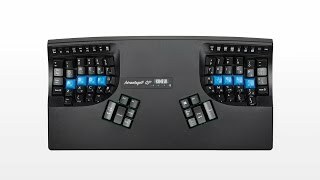 The Advantage layout is a proven design of Kinesis and after using it for a month, I appreciate the work they've done with it. Given the unique design, there may be a bit of a struggle when you first use it, often you will be pressing the wrong keys, but you'll eventually adjust and recover your typing speed after a month or so. With proper use, my wrist pain has been minimized so I would recommend this for professional use. The linear keys are also very welcome reducing stress on the keypresses and the hardware based macros are also very useful particularly for programming. The only minor thing that detracts from this keyboard would be the seemingly shoddy top function keys especially in comparison with the mechanical switches used with the rest of the keyboard. $369.00 List Price: $399.00* The list price is the same as the MSRP (Manufacturer's Suggested Retail Price). It may not necessarily be the price at which the product is sold.